Not only will Wales be making their debut in the finals of the European Championships in France, but they will also be stepping out in the finals of a major competition for the first time since they reached the quarter-finals of the 1958 FIFA World Cup in Sweden. Wales' rise has been spectacular, from a low 112th in October 2010 to 8th in October 2015. Association football will take centre stage ahead of the rugby code for Wales when Chris Coleman takes his squad to Euro 2016. Qualification is a vindication for not only Coleman and his players but also for the foundation work undertaken by previous managers John Toshack and Gary Speed, the latter of whom died tragically aged only 46 in 2011. The present team embodies the resilient spirit demonstrated by the national team ever since the creation of the Football Association of Wales in 1876, the world's third-oldest FA. The legendary Billy Meredith led Wales to six British Home Championship successes in the inter- war years. New heroes emerged in the 1950s, most notably John Charles - the "Gentle Giant" from Juventus - who led Wales to the last eight at the 1958 FIFA World Cup in Sweden. Other stars of that team included Tottenham wingers Cliff Jones and Terry Medwin, Newcastle winger Ivor Allchurch and Arsenal goalkeeper Jack Kelsey. Further ﬁne players emerged down the years, such as Liverpool centre-forward Ian Rush and Manchester United's Mark Hughes and Ryan Giggs, but they narrowly failed to reach the ﬁnals of the 1994 FIFA World Cup and UEFA EURO 96 - the latter tournament was held just across the border in England. Hughes took over as manager in the spring of 2000 and again suffered a near miss. Wales reached the qualifying play-offs for UEFA EURO 2004, but lost 1-0 to Russia. Cardiff City and Swansea City met in the first ever Premier League Welsh Derby in 2013. Leading Welsh clubs Cardiff City and Swansea City have been stalwarts in the English league System. Cardiff, famously, became the only club ever to take the FA Cup out of England, thanks to a famous Wembley victory over favourites Arsenal in 1927, while Swansea's passing game has lit up the Premier League since their arrival among English football's elite in 2011. Their rise coincided with a renewed sense of pride and confidence in Welsh football, with the national team benefitting from a solid core in every department. Former goalkeeper Neville Southall, Wales' record international with 92 caps and a former caretaker manager, acknowledged the point after the team had secured qualification for France: saying "We used to have round pegs in square holes, but we've now got our most balanced squad since 1958, plus a match-winner in Gareth Bale." Bale and other members of Wales’ so-called “golden generation", such as Aaron Ramsey, Joe Ledley, Ashley Williams, Neil Taylor, Joe Allen and Wayne Hennessey, were all handed their debuts by Toshack during his managerial stint between 2005 and 2010. Speed carried on the work by bringing Wales’ team preparation into the hi-tech age. and Coleman has built on all of that. Above all, it has been Wales’ fortune to boast, in Gareth Bale,one of the most exciting players in Europe. 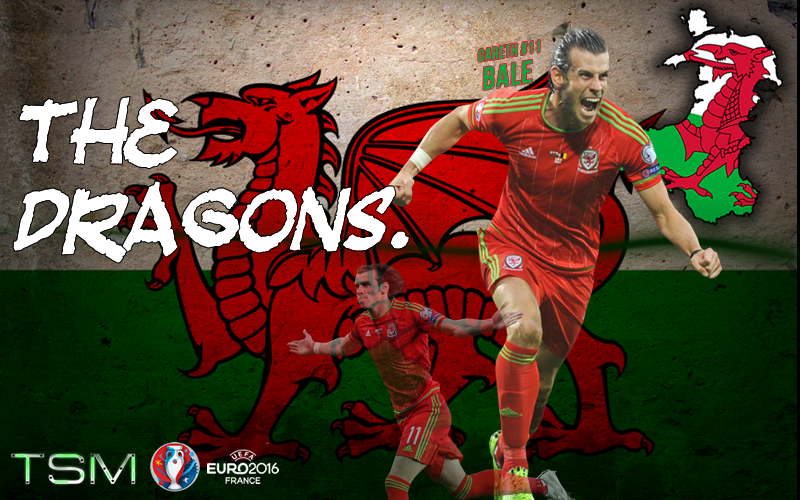 Bale, for all the high-pressure club demands at Real Madrid, has remained intenseley committed to the Welsh cause. He scored the two goals that brought Wales victory over Andorra in their opening qualifying tie in September 2014 and then struck the all-important winner at home to group-favourites Belgium in Cardiff the following June. Fittingly. he also wrapped up Wales’ run with his seventh goal - joint most in Group B with Bosnia and Herzegovina's Edin Dzeko — to seal a 2-0 concluding win over Andorra. Thus Wales travel to France with every player determined to live up to the motto on their shirts: “Together. Stronger." An adrenaline pumped Welsh side will be buzzing for their first major tournament in 58 years, and won't just be there to make up the numbers. Expect Gareth Bale to lead from the front and score plenty of goals in a seemingly weak group, England aside. A meeting with Austria is inevitable, barring a surprise from Iceland or Hungary in Group F. Both sides lack international tournament experience, but I think Austria's squad just edges Wales' and for that reason I think they will advance from that tie. 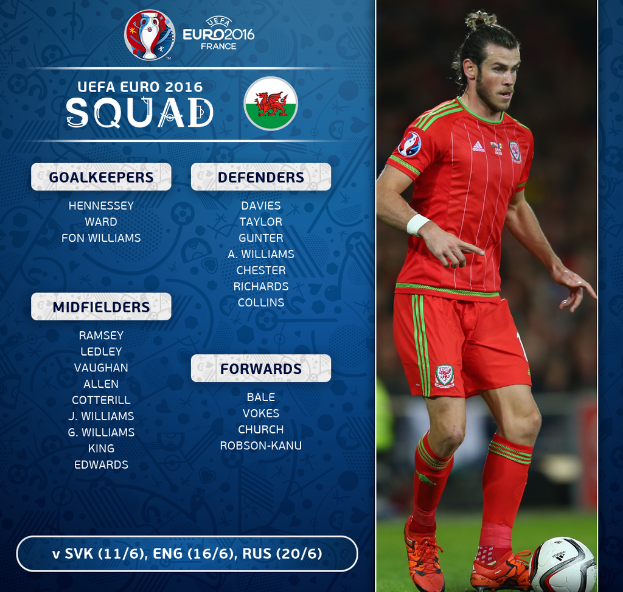 Euro 2016 Preview Series: Wales.